Note: this paywall is going to disappear in 2019. Please follow this guide for the new DaCast’s Paywall. Interested in Monetization through your DaCast Account? Free trials are equipped to set up between 1 and 3 prices per video content and an unlimited number of promo codes per video content. After the free trial ends, you will need to purchase a Pro plan or a 5TB Event plan to get access to the paywall. If you’re already familiar with setting up a paywall, but you want to learn more about promo codes, please check out this guide instead. You have 2 options to set up a price. First, navigate to the MONETIZATION section of a live channel, VOD, package or playlist, as shown below. This option allows you to add the same price to several video files. Please note that the price will be the same for all the video files selected. However, also note that the video files you select must belong to the same category; you may either select only live channels, or only VODs, only packages, or only playlists. For example, setting $5 of access for 1 hour means that someone rents the content for a full hour for five dollars and this timer starts from the minute they begin to watch; in other words, if they start to watch for that hour, pause, and then come back a day later their access will have expired even if they didn’t watch for the full hour in one sitting. This is an option that lets viewers buy more than one “ticket” of access at a time. In the example above, if multiple purchases are enabled, a viewer could spend $10 and get two hours of access. In this way, this pricing option allows viewers to purchase multiple views up front. Unchecking “yes,” as shown in the screenshot above, will disable this option. This refers to two available methods: “Upon Purchase” and “Schedule.” When selecting “Upon Purchase”, the viewer can automatically view content the instant it’s paid for. With “Schedule”, this option is intended for live streams available on a specific date or for time-release content. It allows broadcasters to create a start time for content viewing and to specify a date and specific hour and minute. 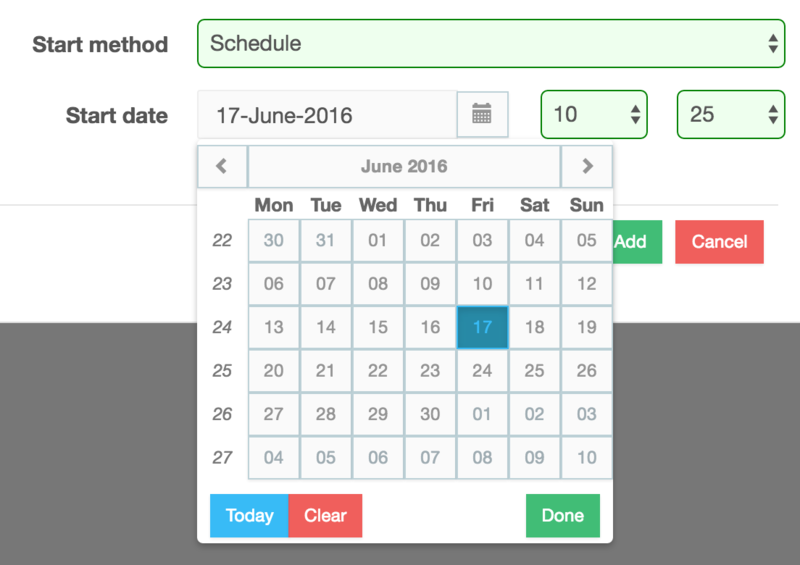 To begin creating a schedule, select this option and place your cursor in the first field which will populate a calendar. Choose the start date of our broadcast, or the “release date” for your Video On Demand content. Next, choose an hour and minute interval, available in 5 minute segments. It’s best to make the window of access larger than the anticipated content, in case the video runs late or starts late. NEW! : From now on, you can select the timezone of the start time of your live event. When you finish with the calendar, viewers can purchase the content ahead of time BUT can only view when the specific date and time roll around. This presents an effective way to pre-sell without worrying that a user will begin their window of access too early. Note: it is important not to change your start time if viewers have already bought your stream, as this can cause issues. If you need to change your start time and viewers have pre-ordered, please contact us. Once the above steps are in place, click the ADD button (or YES button if you’re using the batch configure menu). This will add the price to your video content. If desired, you can attach multiple pay per view options to one stream. Using the example above, you could charge $5 for one hour of access, or you could charge $25 for an entire day of access. Multiple pay per views allow you to up-sell content and add variety to your offerings. 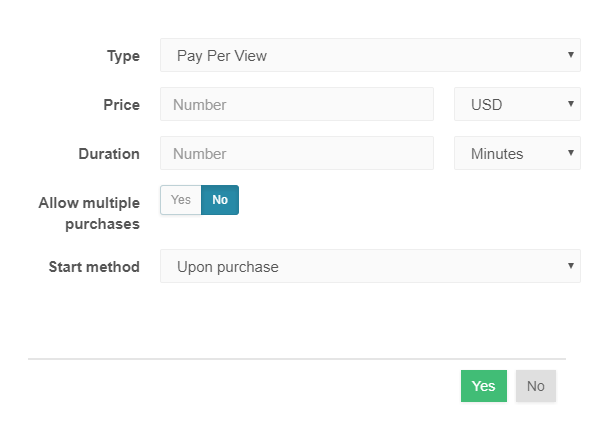 Adding multiple pay per views is equivalent to creating a single view, by entering values and clicking the ADD button (or YES button if you’re using the batch configure menu). For example, choosing $80 and an annual duration will give the viewer a year of access for eighty dollars. If the viewer starts watching in January, for example, they will have access until January of the following year. Once everything is ready, click the ADD button (or YES button if you’re using the batch configure menu). 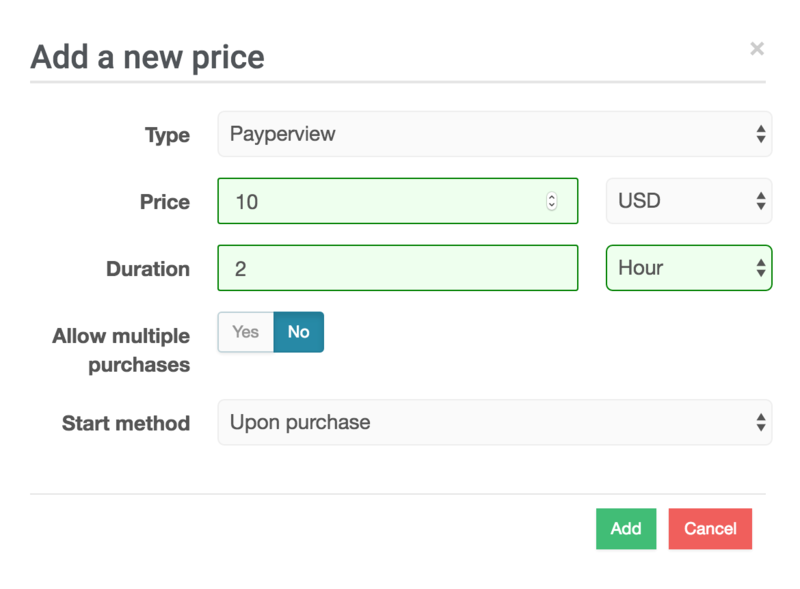 ALLOWING MULTIPLE PURCHASES and START METHOD work the same way as for Pay Per View prices. Like Pay Per View, subscriptions can be combined so you can charge different rates at the same time. For example, on top of the $80 annual subscription above you could also offer a $30 monthly rate as well to provide more options.